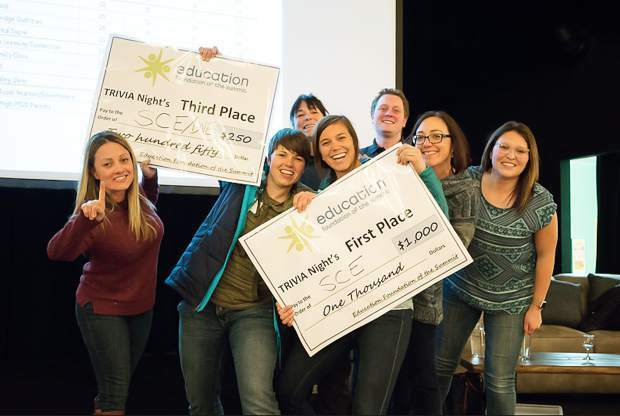 The Education Foundation of the Summit’s Trivia Night, on March 30, was a success, raising $20,000 for Summit public schools. The event, sponsored by Kaiser Permanente, also featured, for the first time, the prize split among several schools, with the intention of distributing the funds to schools that needed the money most. The winners were as follows: first-place team, Summit Cove Elementary, $1000; second-place team, Club Z! Tutoring, $500; third-place team, Carlson & Carlson, $250. According to the foundation’s press release, 34 teams made up of 275 participants competed to win a check for the Summit public school of their choice. The foundation said that all funds raised will directly support innovation in Summit public schoolss, including STEAM (science, technology, engineering, art and math), and innovative classroom technology, including science lab materials, e-readers, museum field trips and theater productions.